Two for the Road is a 1967 British romantic comedy-drama film directed by Stanley Donen and starring Audrey Hepburn and Albert Finney. Written by Frederic Raphael, the film is about a husband and wife who examine their twelve-year relationship while on a road trip to Southern France. The film was considered somewhat experimental for its time because the story is told in a non-linear fashion, with scenes from the latter stages of the relationship juxtaposed with those from its beginning, often leaving the viewer to interpolate what has intervened, which is sometimes revealed in later scenes. Several locations are used in different segments to show continuity throughout the twelve-year period. Raphael received an Academy Award nomination for Best Original Screenplay, Hepburn received a Golden Globe nomination for Best Actress – Motion Picture Comedy or Musical, and Henry Mancini received a Golden Globe nomination for Best Original Score. 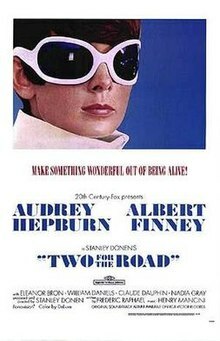 The film's theme song, "Two for the Road", was composed by Mancini, who wrote many notable theme songs for films, including "Moon River" for Breakfast at Tiffany's. He considered "Two for the Road" his favourite of all the songs he wrote. Cars featured in the film, being driven by the couple or ridden in by them, include a white Mercedes-Benz 230SL roadster, an MG TD, a Triumph Herald, an Alfa Romeo Giulietta Sprint coupé, VW Microbus, and a Ford Country Squire; the cars are often used to re-establish the time period after a jump. In one scene of this movie, Audrey Hepburn appears dressed in a shiny black PVC trouser suit designed by Paco Rabanne. The film was ranked #57 on the American Film Institute's 100 Years... 100 Passions list. The earliest memory is their first meeting on a ferry crossing in 1954, when Mark was travelling alone and Joanna was part of a girls' choir. They meet again when Joanna's choir bus goes off the road and Mark helps get them back on the road. When the other girls get chickenpox, Joanna and Mark unexpectedly wind up hitchhiking south together. The next story involves the two newlyweds travelling with Mark's ex-girlfriend Cathy Manchester (Eleanor Bron), her husband (William Daniels) and daughter Ruth 'Ruthie' (Gabrielle Middleton) from the USA. Ruthie is not given any limits, and her behaviour frustrates Mark and Jo. Eventually Ruthie reveals the unkind descriptions of Joanna her parents have made in private. At this point Mark and Joanna decide to travel alone. One scene depicts Mark and Joanna dining in a restaurant during a particularly strained period in their marriage. They are not speaking at all. Joanna looks around the restaurant and asks Mark, "What kind of people can sit there without a word to say to each other?" Mark replies, quite sullenly, "Married people!" Next the pair are seen driving an MG which begins to have exhaust troubles, finally catching on fire. On this journey Joanna announces that she is pregnant. They also meet the wealthy Maurice Dalbret (Claude Dauphin) and his wife Françoise (Nadia Gray). Maurice becomes a generous but demanding client for Mark. In another episode, Mark is travelling alone and has a fling with another motorist. The fling is shown to be fleeting and unserious in nature. Later, Joanna has an affair with Françoise's brother David (Georges Descrières), which is portrayed as much more serious than Mark's and threatens to end the marriage. However, while Joanna dines with David, they witness a couple eating together without saying a word. David asks offhandedly, "What kind of people can sit there without a word to say to each other?" Joanna replies excitedly, "Married people!" and, realizing she misses Mark despite their faded passion, runs back to him. At the end of the film, the Wallaces manage to end their long-term relationship to Maurice and find a new client in Rome. They honestly analyze the fears and insecurities which have plagued them throughout the film. Finally, they cross the border from France into Italy. This is new ground for them as well as for the audience, signalling a move beyond the old issues into a more mature future. Two for the Road has received mostly positive reviews from critics. It currently holds an 83% "Fresh" rating on the review aggregate website Rotten Tomatoes, with an average of 7.2 out of 10. According to Fox records, the film needed to earn $8,950,000 in rentals to break even and made $7,200,000, meaning it made a loss. ^ a b "Two for the Road, Box Office Information". IMDb. Retrieved 9 March 2012. ^ "Full cast and crew for Two for the Road". Internet Movie Database. Retrieved 2 April 2012. ^ "Filming locations for Two for the Road". Internet Movie Database. Retrieved 2 April 2012. ^ "Two for the Road, Movie Reviews". Rotten Tomatoes. Retrieved 9 March 2012. ^ "Awards for Two for the Road". Internet Movie Database. Retrieved 2 April 2012.